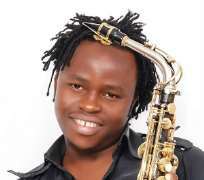 His innovative and creative skills with the saxophone has placed him in an exalted position in the music industry where he effortlessly make ends meet with the work of every popular Nigerian artiste. His, is not to rack brain and create the songs like the musicians do, but to seat back in the comfort of his studio and wait for any hit song by a new or older artiste to create a saxophone version of it, which always comes out classic and fit for any classic occasion. His ingenuity with the saxophone made him get feature in D'banj's classic hit, Fall In Love and he sure enjoys a great relationship with almost every Nigerian musician. With the distinctive style of playing the saxophone, he has no doubt catapulted himself as Nigeria's number one Saxophonist and the top choice of event organizers, a position the popular Mike Aremu used to hold. Unlike the musicians who fade away, he, with his style of using the saxophone is likely to last as long as the music industry does. His saxophone version to the songs he works on, sounds fresh and lively whenever it is played, compared to the original song which becomes boring after a particular time frame. He's had a saxophone version of almost all the popular Nigerian hit songs and he headlines top-notch events where he entertains his audience with lovely tunes, who are mostly of the high class in the society. His case is truly that of grace personified. Truly, 'The race is not to the swift nor the battle to the strong, nor bread to men of wisdom; nor riches to men of understanding nor favour to men of skill but time and chance happenth to them all' Ecclessiastes 9 vs 11.